The Hohner Company of Germany is famous for its harmonicas and accordions. Over the years, it has ‘dabbled’ in the marketing of guitars- both electric and acoustic. Asian in origin, Hohner guitars have run the quality gamut from ‘not-so-good’ to ‘unappreciated gems’. The Hohner model OSC is a Chinese-made guitar that attempts to combine features from 2 classic Fender electrics- the Stratocaster and the Telecaster. And it does a pretty good job of it. The guitar has 3, good sounding single-coil pickups. a top-bound solid ash body and a nice, fat maple neck. I would rate fit-and-finish as ‘very good’ to ‘excellent’. The model OSC no longer appears in Hohner literature or on its web site leading me to believe that it was a short-lived offering (as many Hohner models have been). The little cherry red guitar you see pictured was an Ebay find. Opening bid was just $100.00 US! So I bid $100.00 and assumed my bid would be bettered long before auction’s end. Well, it wasn’t! 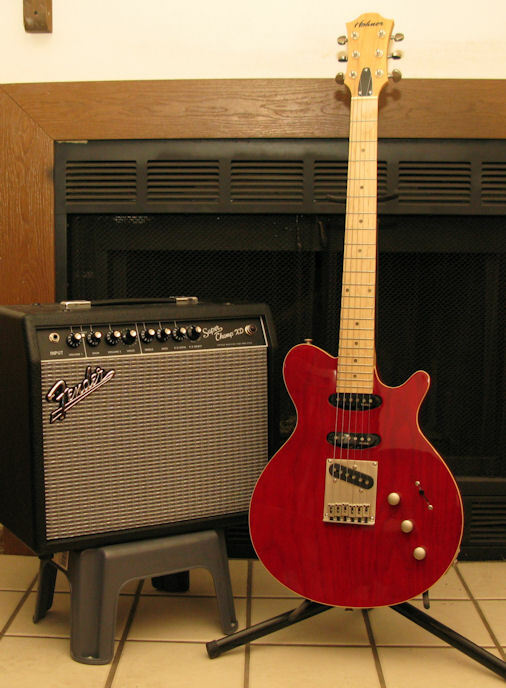 And I became the proud owner of this versatile, easy-playing, great sounding ‘rock-n-roll’ electric. I was fortunate enough to find a new OSC (same finish as yours) here locally. At the store I fell in love with it immediately and started researching it on my phone but couldn’t find a lot of info. Bought it anyway, did some quick saddle adjustments and removed some fingerprints. Man what a great guitar! Does the Tele and Strat thing very well and I would say both are equally convincing. I contacted Tesla pickups because I like what I hear from the OSC. They sell direct in the US so I might be changing out some of my other guitars. I would have loved to get this guitar for $100 (I paid $250) but even at what I paid, its more than worth it. I agree, Joe! These are great finds. Happy pickin’!